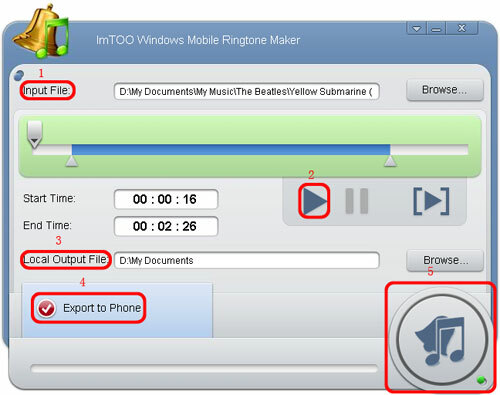 ImTOO Windows Mobile Ringtone Maker can help mobile phone users make custom MP3 ringtones from nearly all video and audio files such as WMA, AAC, WAV, CDA, OGG, FLAC, APE, CUE, M4A, RA, RAM, AC3, AVI, MPEG, WMV, MP4, FLV, MKV, AVCHD etc. Here we will guide you to create ringtones for your mobile device step by step. 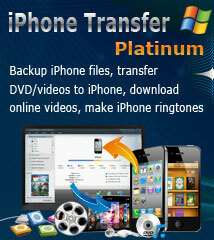 Firstly, download, install and launch ImTOO Windows Mobile Ringtone Maker. Then, the main interface pops up. 1. Click the "Browse" button right beside "Input File" label to select the video or audio file you want from the dialog box that pops up, then click "OK" button. You will see the file path and name are displayed in the "Input File" textbox. 2. Click "Play" button to listen to the music before creating ringtone and locate the part you really want, then drag and drop the start & end sliders to get the music clip, or type the start & end time in the corresponding text box directly. 3. Set output folder by clicking "Browse" button on the right side of the "Local Output File" label. 4. If you wish ImTOO Windows Mobile Ringtone Maker helps you upload the ringtone to your Windows Mobile phone directly after conversion, then check "Export to Phone" option. 5. After all above are finished, click the big button at the right bottom to start creating your own Windows Mobile ringtone. During the creation, you can check the process by the progress bar at the bottom. 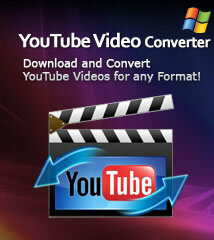 Just in a few minutes, you can make your own Windows Mobile ringtone from the music/video you love. How to make free iPhone ringtones?